West Park is an underground subway station in Grand Theft Auto IV, in the Liberty City Subway system, serving the N Q and W lines, which run on the Algonquin Inner Line and Bohan Line. 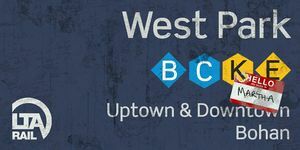 West Park is one of three stations named after and located adjacent Middle Park in uptown Algonquin, Liberty City, located on the western side of the park near the intersections of Obsidian Street and Frankfort Avenue, at the border with Middle Park West. Three access points are available, all located on the southern corners of the intersection; two are found on the western side of Frankfort Avenue (on the northeastern corner of Mammon Heights), and the third entrance is plotted on the eastern side of the street. Other than the park, the station is also located close to the Randolf Art Center. This page was last modified on 9 August 2012, at 13:51.